Is There Anything I Can Do About My Dog’s Tear Stains? If you have a white or light-colored dog, you may have noticed red or brown stains leading away from your dog’s eyes. What are tear stains, anyway? What causes them? Is there anything you can do to get rid of them? How effective are the various products marketed for clearing up tear stains? -Shallow eye sockets. If the eye sockets aren’t big or deep enough, tears can spill out onto the fur around the eyes. -Eyelids that are turned inward. If the eyelids roll in toward the eyeball, the drainage holes for tears (called puncta) may become blocked. -Hair growth around the eye. If hair grows too close to the eye, it can wick tears away from the eye and onto the face. Reddish tear stains are the result of porphyrins – iron-containing molecules which are actually waste products from breaking down red blood cells. Most animals remove porphyrins with the rest of their waste, but dogs also release them in their tears, saliva, and urine. When tears laden with porphyrins sit on your dog’s fur for an extended amount of time, it will cause staining. Sunlight can darken these stains. Brown tear stains are the result of a yeast infection caused by the perpetual dampness on your dog’s face. Yeast infections typically smell, whereas red tear stains typically don’t have an odor. What Types Of Dogs Are More Prone To Tear Stains? So, what can be done about those pesky tear stains? Washing your dog’s face once or twice a day with a very mild shampoo may help eliminate tear stains over time. Dogs with hair that constantly grows need regular grooming anyway. 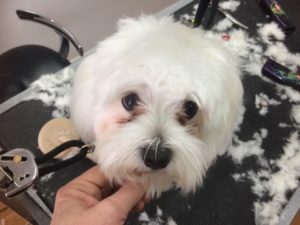 Having the groomer trim a little more than usual to start with a blank slate while moving on to preventing tear stains from forming again may be the safest bet to get rid of those unsightly stains in a hurry. Please note that serious tear stains may affect the dog’s skin and won’t be able to be shaved off with other hair around your dog’s eyes. So if there isn’t one sure-fire way of getting rid of tear stains, can you at least prevent them from coming back? Luckily, there are a lot more ways to prevent tear stains than there are to try to get rid of them. The higher-quality food you can provide for your pup, the better off he’ll be all around. Healthy Pets recommends “Provid[ing] your pet with fresh, filtered drinking water instead of tap water, which is often high in mineral content or iron and other impurities, including chlorine and fluoride, which are toxic to pets.” As a matter of fact, nearly every source used in this article recommends giving your dog distilled or filtered drinking water as a solution for preventing tear stains. At the very least, wiping your dog’s face twice a day with a wet washcloth should help prevent tear stains from building up over time. A very thin layer of corn starch dabbed below your dog’s eyes (be careful not to get any in the eyes) can help prevent moisture from lingering on your dog’s face. Hopefully some of these tips will help you find solutions to start mitigating your dog’s tear stains. Do you have any tried and true tips not mentioned here? Be sure to leave them in the comments section for our other readers!